Account-based marketing is an approach to marketing that flips traditional marketing on its head. Rather than developing buyer personas and then casting a wide net to attract those personas to your brand, ABM sends targeted messaging to specific accounts that are a high fit to your existing buyer personas. This makes account-based marketing a more upfront investment due to this very targeted and very researched method. So let's dive into account-based marketing, when you should take advantage of this strategy and how to start implementing it at your B2B business. As we mentioned, account-based marketing is all about sending tailored messages to targeted accounts. With this initial investment into research and copywriting to create highly specific content, your return on this investment is going to differ from the ROI of a traditional inbound marketing campaign. In a regular marketing campaign, you'll still invest some time into developing educational, persuasive content, but it will be designed to reach a much larger audience and will have a higher probability of attracting someone to your brand. With ABM, you're investing more calories into creating tailored content and then sending it to a smaller group of people, which at first glance gives you a smaller ROI. However, your inbound marketing campaign may not always attract qualified leads to your content; an account-based marketing strategy may bring in fewer leads, but they will be higher quality with a greater chance of converting into customers down the funnel. When should you take advantage of Account-Based Marketing? First, your company should take advantage of account-based marketing if it has an inherently smaller Total Addressable Market (TAM), or smaller audience who could buy your product or service. This may happen if you're in a niche market with fewer net new customers, but larger contract sizes. 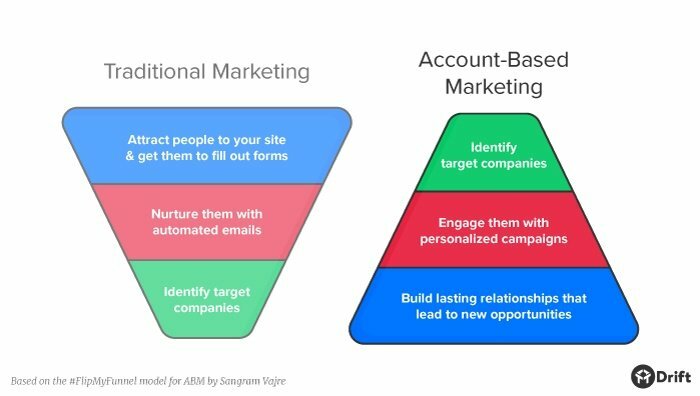 By deploying account-based marketing, you can find and target the handful of accounts who are a high-fit for your offering and get them into your marketing and sales funnel. Because your organization has a smaller TAM to begin with, you're not wasting time and resources by creating a targeted campaign. And is everything is working well? Then you now need to ramp up with a new approach. At this point, there's not much else you could do to increase lead velocity, and account-based marketing is a good next step for your organization. ABM can be deployed to boost the effectiveness of your funnel because it adds another avenue for lead generation. Just like demand generation, account-based marketing is another opportunity for when you've refined all the fundamentals. On the other hand, you shouldn't take advantage of an account-based marketing strategy if you're not able to justify the shift in the risks versus rewards of this type of campaign. For example, if your sales team is already overwhelmed trying to follow up on their current leads, they don't need this additional avenue to start generating even more. Also, if there are still other areas of your existing inbound marketing campaigns and strategies that could be further optimized, you should first devote your time to improving those. This is especially true if your organization naturally has a larger TAM. While an account-based strategy can still be successful, you want everything operating efficiently before investing this energy into such a targeted approach when a traditional campaign could attract a much larger audience. In general, don't start using ABM just for the sake of using ABM - you really want to ensure everything is working correctly before adding a new layer onto your system. How do you start implementing an account-based marketing strategy? 1. Identify a set of companies you believe are a high-fit for your product or service. Keep in mind that each company should be large enough to run an ABM campaign on, yet small enough to not exhaust your resources in creating the campaign. We recommend testing your first ABM campaign on 10-15 target accounts that have enough similarity so you don't have to completely reinvent the campaign for each account. All of these companies should also fall within a single buyer persona. 2. Figure out the overarching campaign you want to deploy in order to target these accounts. Then, develop the specific messaging for each account and all of the associated content to be pushed out through the duration of the campaign. We recommend reviewing any existing clients who are similar to these target accounts to see which marketing strategies worked for them and what you've solved for them since starting the partnership. You should also leverage these case studies in order to prove your benefit to their business. Lastly, you will have to decide on the account-based marketing tactics you'll want to use in order to get your newly developed content in front of these accounts. Did you attract people from these companies to your website? Did any of them engage with content outside of the campaign? Did you convert any of them into leads? Customers? While formulating your definition of success, remember to consider the length of your average sales cycle. If your average sales cycle takes three months, it's not realistic to expect an accurate insight into the success of your account-based marketing campaign after only one. Especially since companies with smaller TAMs tend to have longer sales cycles, you need to be practical about your timeframe for measuring your return on this investment. Since an account-based marketing approach requires a much larger upfront investment, it's wise to dedicate a portion of this investment into collecting accurate research into the companies you're trying to attract. The target of this campaign will be much smaller, so you need to spend more time aiming if you want your efforts to pay off. Like other outbound marketing methods, you'll need to be careful about implementing account-based marketing in an inbound way to maximize its value. And as always, don’t forget to measure your results and optimize accordingly.